Thrace is a geographical and historical area in southeast Europe, which is bounded by the Balkan Mountains to the north, the Aegean Sea to the south and the Black Sea to the east. Sections of Thrace started to become hellenized before the Peloponnesian War as a significant amount of Athenian and Ionian colonies were set up in Thrace before the war, and Spartan and other Doric colonists followed suit after the war. 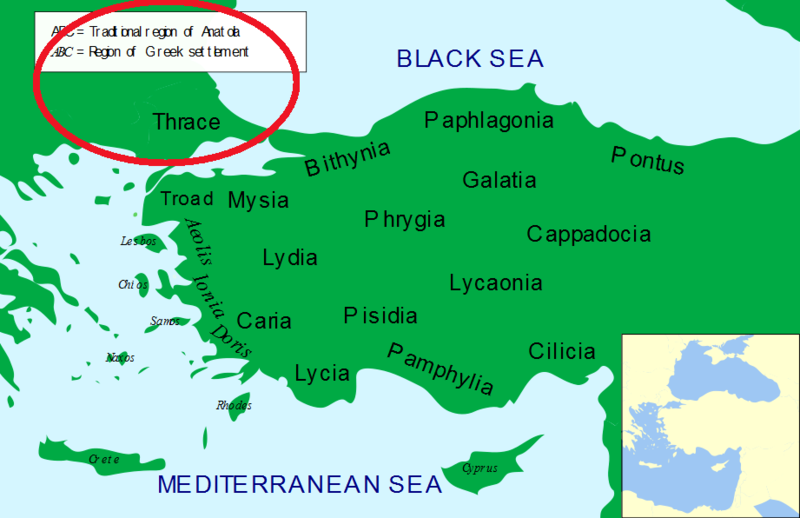 In 168 BC Thrace became subject to Rome, and in AD 46 a full province. Ref: May 191; SNG Cop. 312 ff. (5) Aelia Flaccilla 383 A.D. Reverse: VICTORIA AЧGЧ Z, cross potent on three steps; at sides, Heraclius and Tiberius standing facing, each holding globus cruciger; CONOB in exergue. Reverse: + IhSЧS/XRISTЧS/bASILЄЧ/bASILЄ· in four lines across field; above and below; ornate As. (50) Constantius II 348-350 A.D. Reverse: FEL TEMP REPARATIO, radiate phoenix standing right on globe. Ref: RIC VIII Constantinople 93B. (51) Constantius II 348-351 A.D.
Obverse: DN CONSTANTIVS PF AVG, Pearl diademed, draped, cuirassed bust, right. Reverse: FEL TEMP REPARATIO, Phoenix, radiate, standing right on globe. Reverse: phoenix on globe right; FEL TEMP REPARATIO / CONS? Reverse: WANHC DECPOTIC O PALEOLOGOC QV XAPITI AVTOKPATOP in two lines around nimbate facing bust of John VIII; dot to left and right. Obverse: D N I - VST - INVS PP AVI, Helmeted bust facing, holding Victory on globe and shield. Reverse: VICTORI - A AVGGG ? (officina 4) around, CONOB in exergue, Constantinipolis seated facing, head r., holding spear and cross on globe. Ref: SNG Copenhagen 862; BMC 1. Obverse: +LЄOҺ bAS-ILЄVS Rom. Crowned and draped bust facing, holding akakia. Reverse: +LЄOҺ/ЄҺ ӨЄO ЬA/SILЄVS R/OmЄOҺ in four lines. Reverse: +LEOh Eh ΘEO bA-SILEVS R-OMEOh, legend in four lines. Obverse: D N MAVR TIBER PP AV. Helmeted and cuirassed bust facing, holding globus cruciger and shield. Reverse: Large mark of value K; ANNO to left, cross above, X/I to right, A in exergue. Ref: AMNG 2200; Mionnet 890. Obverse: M IOVΛ ΦIΛIΠΠOC KAICAP, bare-headed bust of Philip II. Reverse: BIZVHNΩN, Thanatos (god of death) or weary Eros extinguishing torch. Ref: BMC 15, Moushmov 3519. Reverse: Wide trident; MAKE / ?ΔONΩN?